Scoot Safely’s Alan Hearnshaw got some seat time on Piaggio’s highly anticipated new BV350. I think he likes it. My most consistent memory of the Typhoon 50 was as the scooter local dealerships were most likely to donate to the yearly rally raffle — leaving me with the impression that it was unremarkable enough to simply give away. Piaggio/Vespa dealers in Texas have reported in a post on ModernVespa that Piaggio’s buzzworthy BV350 ST is now shipping in the US and is due to start arriving in showrooms as soon as tomorrow, April 17. It’s common to replace the rear tire on a two-wheeler twice, sometimes three times, before the front tire needs swapping. 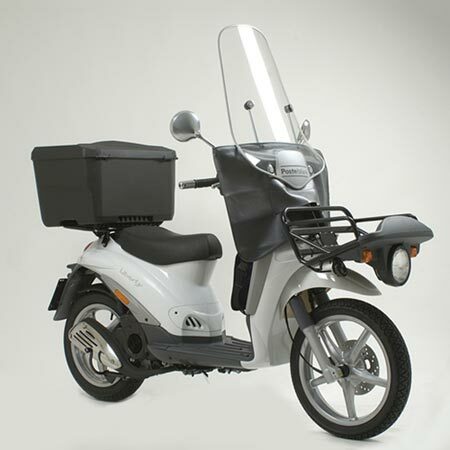 Owners of the Piaggio MP3, however, seem to be wearing out their front tires at nearly the same rate as the rear, at least according to Scooter Station. The rumor mill is running full blast after this weekend’s Piaggio dealer meeting in Florida, where the company displayed the Vespa 946 “Quarantasei ” concept unveiled late last year at the EICMA motorcycle show in Milan. Piaggio held their annual dealer meeting this weekend and among the big announcements was that “the world’s fastest motorscooter,” the 840cc Aprilia SRV850, will be coming to US dealers as soon as fall of this year. Since its unveiling at the International Motorcycle Exhibition (EICMA) in Milan last fall, the Piaggio Beverly Sport Touring 350 has been one of the most highly-anticipated and talked about new scooter models for 2012.